Ms. Larson has been described by USA Today as possessing a "golden voice." She enjoys a solo performing career that encompasses appearances with many of the nation’s finest orchestras and chamber ensembles, a growing catalogue of recordings, and successful performances in major operatic roles. 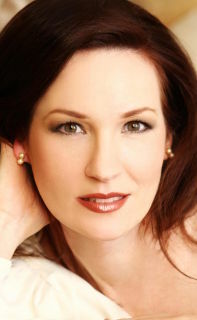 An international semi–finalist in the prestigious Competizione dell’ Opera (2001), and national finalist in the 1997 Metropolitan Opera Council Auditions, Ms. Larson has received honors for her dramatic and vocal artistry in leading operatic roles, including Violetta in La Traviata, Pamina in Die Zauberflöte, Governess in Turn of the Screw, and the title roles in Floyd’s Susannah and Stravinsky’s Le Rossignol. In demand as a concert soloist, she has been applauded with groups including the Milwaukee, Utah, Illinois, and Detroit Symphony Orchestras and the Mormon Tabernacle Choir, singing works from baroque to modern under the batons of such noted conductors as Keith Lockhart, Bright Sheng, Andreas Delfs, John Mauceri, Kenneth Kiesler, and the late Robert Shaw. A favorite soloist with contemporary music organizations, Ms. Larson is featured on several compact–disc recordings of original works, including Morris Rosenzweig’s On the Wings of Wind (CRI, 1998), Functionlust works for horn and voice with William Barnewitz of the Milwaukee Symphony (Summit Records, 2001), Mark Gottlieb’s Woodworker’ s Son (GottMusik, 2002), Steven Ricks Leave Song (Capstone Records, 2003), and scenes from Paul Schoenfield’s opera The Merchant and the Pauper—part of an eighty–disc set of American Jewish Music produced by Milken Archive (Naxos, 2004). Last April, Ms. Larson filled an invitation to perform in concert at the National Gallery of Art in Washington D.C. She returns to Utah Voices after soloing with their memorable Carmina Burana in April 2010. Upcoming highlights include several oratorio engagements and a national solo recital tour. Having earned bachelor’s and master’s degrees in Voice Performance from the University of Utah, and a doctorate from the University of Michigan, Dr. Larson is in her fifth year as a full-time Assistant Professor of Music in Voice and Voice Pedagogy at Wartburg College in Waverly, Iowa where she lives with her husband, and three sons.